The Britain-based Observatory reported shelling attacks on the Aleppo neighbourhoods of Haidariyeh, Hanano, Meyseer and Shaar overnight Monday. One rebel had been killed in the fighting. 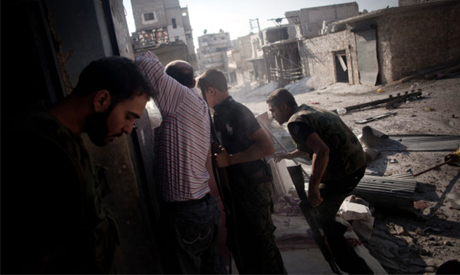 "The rebels have been trying for three days to enter Midan (in central Aleppo). Last night the army launched an operation and pushed them north, back toward Bustan al-Basha," a resident told AFP on the phone. "The city is quiet now," the resident added. In the town of As-Safira, "mortar fire from an air defence battalion targeted residential buildings and a school, where many refugees from disaster-stricken areas sought refuge and shelter," according to the Local Coordination Committees (LCC), a network of activists on the ground. The Observatory said it was unable to immediately confirm the report. Drinking water supplies – cut off in many areas of the city after a main pipe was blown open during fighting and government air raids on Saturday – were back restored after repairs, the resident said. But shortages persisted in the northeast of the city, including in rebel-controlled district of Bustan al-Basha. In the capital, an explosion rocked the upscale western district of Mazzeh overnight, while pro-regime gunmen clashed with rebels in Barzeh, another wealthy neighbourhood in the northeast, the Observatory said. One man was killed in the northeastern suburb of Douma in unknown circumstances, while a child died after being hit by mortar rounds in a town elsewhere in the same province, the Observatory said. The LCC meanwhile reported that helicopters were flying over Damascus and its suburbs. The activist network reported that government forces stormed the town of Daraya with tanks and heavy machinery. Daraya, a conservative Sunni town just south of Damascus was where hundreds of bodies were found in late August after an army onslaught in what activists called a "massacre". In Deir Ezzor province in the east, warplanes bombarded the town of Albu Kamal. In Deir Ezzor city, clashes broke out amid shelling, and rebels deployed anti-aircraft guns as helicopters were seen hovering over the area. One man was killed in the northwestern province of Idlib, the Observatory said, as fierce clashes broke out in Idlib city between the rebels and military backed by aircraft. On Monday, 139 people were killed across Syria, including 105 civilians, according to the Observatory. Among those, 23 civilians were killed in the southern Damascus district of Tadamun alone, while in Aleppo, 16 civilians were killed in shelling on Sakhur and Shaar districts in the east.